John Steadman, journalist for the Boston American is called "The Body Man". He is known for going on scene to a tragedy and telling the stories of those who died. When the luxury passenger ship, the RMS Titanic sinks during her maiden voyage, John rushes to find out what happened to those who died so he can tell their story. The story unfolds in small bits and it becomes apparent to John that there is a bigger story to tell this time. The SS Californian, a mid-size cargo ship, was in the same Atlantic waters and the closest ship to the Titanic at the time it sank. Captain Lord had stalled her engines that night because they were surrounded by ice. 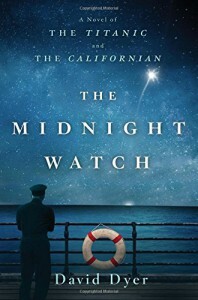 Second Officer Herbert Stone was in charge during the dark hours of the midnight watch and witnessed a nearby ship fire eight distress rockets. When he reported them to the captain, nothing was done. John races time to try and find out why the distress rockets from the Titanic were ignored by the nearest ship. Over 1500 who died might have been saved if the SS Californian had answered the signals from the Titanic and gone to her aid. What captain would choose to ignore maritime rules, and why did it happen? This is the bigger story that John is trying to tell; all the while battling his editor over deadlines and a threat of being fired. He interviews those who were there and attends hearings trying to get a grip on exactly how to tell this story and what viewpoint to take. Each time he thinks he knows where his story is going, new information comes along which changes everything. Author, David Dyer does a fantastic job mixing fact and fiction. I found myself online checking out some of the facts after reading the book. Ultimately the fate of the Titanic was ruled to be an accident but maritime regulations did undergo some changes after the tragedy. The SS Californian was indeed a nearby ship the night of April 15, 1912. They were the last to have been in contact with her before the collision and they saw her flares but failed to assist. David Dyer takes us onboard the Californian to see what the ship’s captain and crew might have been thinking that night. He also gives us a fictional look at one family of eleven who died on board the Titanic. I recommend this book highly for those who know a little, or those who know a lot about the tragedy of the Titanic’s sinking. This is a very human story both from the viewpoint of the Titanic's passengers and from that of the Californian's crew. I really felt as if I were actually there among those who were close by as the Titanic sank to the bottom of the Atlantic Ocean. A great piece of historical fiction!